This motto perfectly describes the Mamma Mel’s Learning Center, a bilingual, progressive early childhood program in Rincón, Puerto Rico. The school offers a full immersion model, exposing the students, ages 3-8, to English and Spanish every day, all day. Melanie Smith, the program director, believes that children learn through play, and she has created a beautiful, eco-friendly space for the kids, including an art studio, organic vegetable garden, yoga classes, and music. The Mamma Mel’s curriculum emphasizes respect and love for the environment and our small community… which is where I come in. Since August, my Tuesday afternoons have been filled with the laughter of K-2 students during our weekly oceanography workshops. As a marine scientist, who spent nearly 10 years in academic research, I have discovered my true passion involves ocean education and outreach. 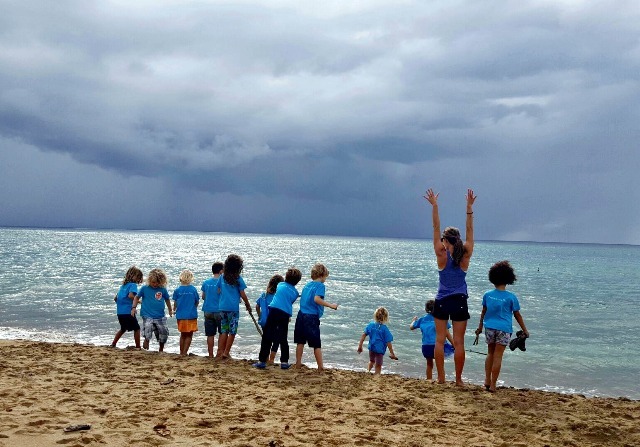 Teaching my community, and especially its children, about the sea, a crucial resource that we are inextricably linked to, provides an incredible opportunity to “give back”, after having the privilege of living my dream of becoming an oceanographer. A firm believer in hands-on education, I have an amazing opportunity to teach these students outside, at the beach. They take a stroll to the ocean for lunch and play; then we begin our lessons about the deep blue sea. Their eagerness to learn, week after week, astounds me, and they can hardly wait for the topic of the day to be announced. We have covered everything from biology to geology, from the ocean zones to how beaches are formed. 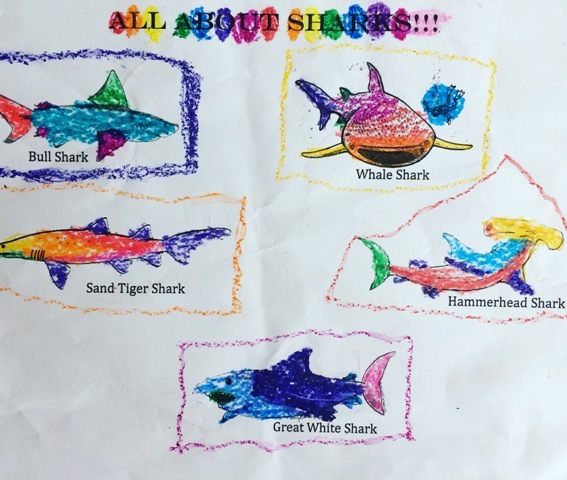 The children have created their own marine food chains, learned about sea turtles, built a coral reef, and imagined life as the tiny, microscopic plankton that support the entire ocean food web. My favorite workshop focused on marine pollution and debris, which is a huge threat to the health of our oceans. Plastics are, by far, the worst offender. Did you know that ~74 million pounds of plastic are spread throughout the world’s ocean gyres (circular currents)? Over 50% of all marine mammal species on the threatened list have been observed entangled in or ingesting plastic. Tiny, toxic micro-plastics have increased 100 times in the North Pacific Gyre over the past 40 years and are eaten by marine life, which then are consumed by us. After discussing the problems with ocean trash and how long it takes to biodegrade, the students happily (and quite enthusiastically) helped with a beach cleanup, filling an entire garbage bag in less than 15 minutes. They were so proud of every piece of trash, and my heart filled with joy while observing their precious hands tidying Mother Earth. 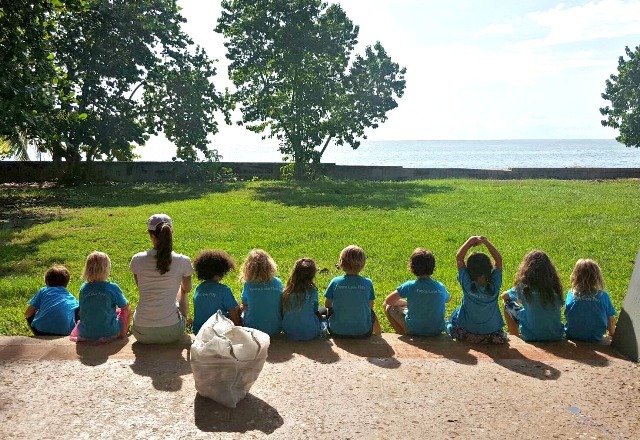 To wrap up our lesson, we made a pact to reduce the amount of trash we created, pick up litter during every beach visit, and share what we learned with friends and family. As I watched the kids walking, with lunch boxes in hand, back to school, I realized the importance and impact of spending time with our future generations. It truly makes a difference. We are leaving this planet to these brilliant and passionate children, who deserve a beautiful Earth to enjoy and care for. What can you do to help minimize marine debris? Use less plastic. Recycle. Opt for reusable bags. Cut apart plastic 6-pack rings before disposal. Avoid single use plastics (straws, utensils, plates, to-go cups, water bottles, etc.). Bring your own to-go containers. I dedicate this piece to my mom, Cindy Schwierzke, a beloved Flour Bluff ISD kindergarten teacher, who passed in 2012. Her legacy shines bright.